Here’s an interesting case for you: A good friend has a lab cross, MeMe, who was badly skunked a few nights ago. This appeared to be a direct hit to the eyes, the poor dog was rolling desperately on the ground, gagging repeatedly and batting at her eyes. MeMe got medical care and appears to have recovered, but here’s her owner’s question: When Debby found her, she cringed and cowered, “belly nearly scraping the ground, eyes averted and tail down.” Debby said she looked like she was afraid she was about to be hit, although that has never, ever happened. (Okay, it’s not like I live inside the dog’s collar, but I know Debby, and believe me, she’d no more hit a dog than I would.) Debby was not scolding MeMe in anyway, but MeMe still had her head and tail down in the positions that people inaccurately (not Debby) call “guilty,” and she behaved as if she was afraid to get close to Debby, even when she held out cheese. MeMe eventually crawled into bed with Debby that night (still skunky, what a dedicated dog owner!) 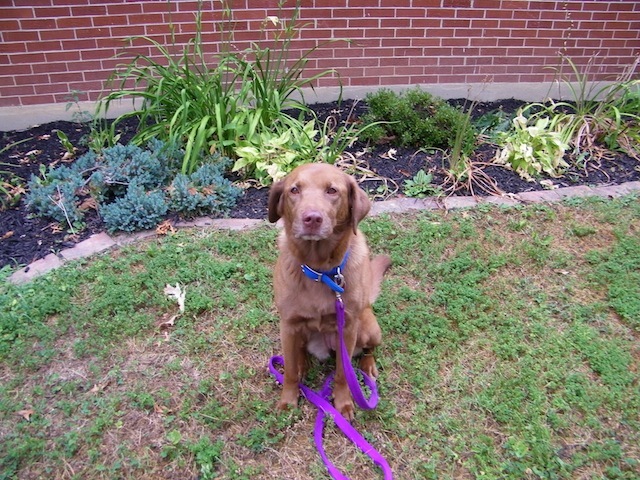 but cowered her way into the vet clinic the next morning, when normally she’d dash in all excited to see her friends. Here’s the question: Why did MeMe behave that way? Was she really afraid of Debby? What did her postures and signals mean? I’d love to hear your speculations. I’ll chime in after a few days with my own ideas. Debby sent me a photo of MeMe the next day, eyes still a bit red, but healing. After trapping 4 kittens last week, we successfully live trapped first mom and then her last kitten on Saturday night (with two traps, side by side, cats trained to enter by placing food farther and farther back inside the traps). I was thrilled to find mom in the trap at about 9:30 pm Saturday night (I was feeding her every night at 9) and then the last kitty in the other trap in the morning. Yeah! Just call us Trapper Trisha and Jungle Jim. Mom, who is now named Xena, was taken first thing Sunday morning to Friends of Ferals for their monthly “Spayathon” and spayed that morning. New Kitty was put in with the gingers, where she hid behind the toilet and hissed at me whenever I entered. Xena returned from spaying on Sunday afternoon, and on an expert’s advice, I let her out of the small trap into a larger dog crate in the barn to heal up for a few days. Worried, I checked on her often, even though I couldn’t handle her. I thought about capturing her with a rabies pole and taking her to my vet, but decided that would just stress her more. I used a flashlight to look for blood on the towel she lay on, nothing there. She ate the food I left her three times a day–more good signs. I finally opened the crate door Tuesday morning and left the barn. When I returned an hour later she was still lying in the back of the crate as if she hadn’t moved. Uh oh. That had me worried. Back an hour later… still there. Oh dear, not good at all. I decided to give her one more hour, and put food on both sides of the doorway. When I returned a half hour later, she was gone. But would she ever come back? Was she recovering or not from her surgery? A bit later I heard a plaintive cry from the woods above the barn. Oh damn, I first thought, she’s injured and desperate and I’ll never find her again and what will happen to her now and… But then I remembered that injured or ill cats don’t vocalize, they go silent as stone, as my own injured cat Ayla did so many years ago. Perhaps then, I thought, she was calling for her kittens. That was my hope, but I could only guess and worry. Kitten Calico and Momma Xena are now re-united. So far anyway, everything is going as well as I could hope. First, Calico is 100% socialized to people. She seeks out people, rubs against us, loves chin and belly rubs, and plays like a champ. She is physically fearless and already Olympic in her athletic ability. She tamed down much faster than the others, primarily because she was alone and I spent more time with her, but I think she is also a bit of a fearless little sprite. Once she began to come when I called her, and was clearly enamored of people, I began carrying her to the barn and feeding her there, letting her play in the hay for a few minutes, and then bringing her back into the house. The first time out she played around the barn like a wild woman while I held my breath I’d be able to get her back. Yesterday afternoon I sat in the haymow and while she played I read A Lawyer’s Journey, a fascinating book by Morris Dees, founder of the Southern Poverty Law Center. I heard a plaintive meow from outside of the barn, and sure enough, it was mom. I stayed quiet and still, and in a few minutes Xena walked in, saw me and trotted out. I stayed a few minutes more, left some chicken for mom, picked up Calico and the two of us went back to the house. After a few hours we went out again, and this time Xena walked into the barn and greeted Calico while I sat, breathless, heart pounding, totally enraptured by mom and kitten re-acquainting. There was no doubt they remembered each other. After several minutes of rubbing, sniffing and vocalizing, Xena moved further into the barn and realized for the first time that I was there. She left again, but this time withdrew only a few feet, sat in the grass and growled at me. Never have I been so happy to hear a cat growl. I was about to pick up Calico and take her back for the night, but my gut said no, better to leave her here with momma so they can complete bonding. So that’s what I did, walked back to the house taking deep breaths while the night sky turned navy blue and the farm light glowed over the driveway. Not so easy to leave this little bundle of fur to herself and her mom, but I felt it was the right thing to do if Calico and mom were to live together in the barn. This morning I looked out first thing toward the barn, and there Xena sat in the driveway. She didn’t run off when I took the dogs out to pee (another first), and little Calico popped out of her hidey hole like a piece of toast when I called for her when I went to visit. I’ve seen her twice since, bringing food and head rubs and toys to play with. My ultimate hope is that Calico will help Xena learn that not everyone wants to hurt her, and that she can count on me to feed and protect her. 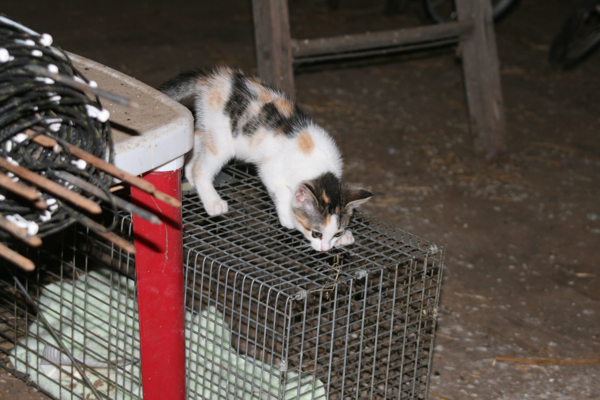 Here’s Calico yesterday sniffing the trap that caught her mother. She was fascinated by it, went back to it over and over again. Not long after that, Xena began to meow from the woods. And the others? Little “orange and white,” now Amelia, is described as the friendliest, most social cat Scott has ever had. She is flourishing and about as happy as a kitten can be. So are Brave and the other 2. All the kittens (the 4 I still had anyway) went to the vet on Monday for vaccinations and worming, where I discovered that little boy “Not Brave” is actually a little girl. Whoops. But they all progressed well over the weekend, Brave taking food right off your finger, happily playing with toys with you, while the newbie slowly adapted to taking food from a long spoon. Dan Johnson of Friends of Ferals came to take them on Tuesday, where they will be up for adoption sometime soon. If I thought my farm could handle 3 cats without compromising the wildlife, I would have kept one more in a minute. They are gorgeous and lovely kittens, and I will do my best to follow their adventures in life. I hear that two of them might have found a home already. 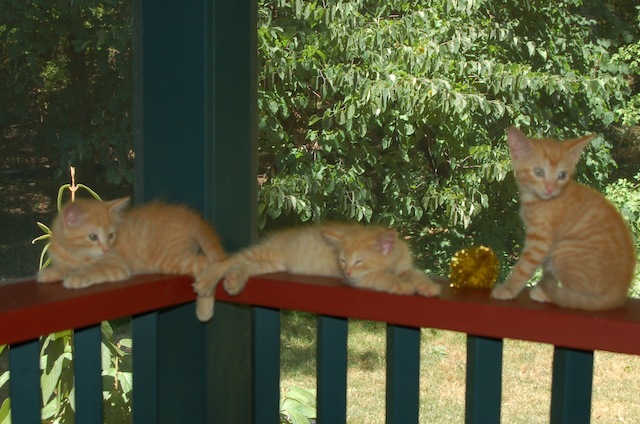 Here they are lounging on the porch (thanks Dan for the photo!). And I have to go out of my way again to thank Dan, Kelly, Dr. Adam, Dr. Susan and all the wonderful people who volunteer for Friends of Ferals. The world is a better place for your efforts. It’s been quite a ride, this adventure that began with Sushi leaving and Xena coming. As a zoologist I know that Xena most likely came into the barn because of the vacuum left by Sushi’s absence. That’s no doubt true, but I still want to believe that maybe, just a little bit, the universe knew how much my heart ached for a cat, and decided to do something about it. What a wonderful story! Thanks so much for sharing it (and the photos) with us. I’m glad you’ve got kitties in your life again. I wonder if MeMe’s scent and sight were compromised to the point that she couldn’t positively ID Debby as her own person. It’d certainly be scary to have a chemical assault followed by a looming, blurry presence, even with a familiar voice. I would dare to say that the poor dear was in total misery, pain even, maybe disoriented and so in fear. Also, if Debby was freaking out, or even just desperate MeMe probably picked up on that too, since she seemed to be the target. We had a sweet flatcoat retriever that got skunked in the head/face years ago. Didn’t get his eyes, but he was awake but sort of comatose for a 2 or 3 days. The vet said that getting skunked never killed a dog, yet Petey was so totally miserable and incapacitated – I had to carry him outside, stand him up to do his business. Maybe we should have taken him to the vet anyway. Petey survived, revived and was with us for a few more years. So so sorry to hear about MeMe, but glad she is recovering. I have taken to scouting our yard with a flashlight before letting our dog out or going with him on a leash and with the flashlight then letting him off leash after I see no skunks as we seem to have lots of aroma in the neighborhood. I think MeMe is using apeasement behavior after having her sense of smell and sight blasted (not a technical term) not to mention the pain she was experiencing. She recognized her Mom’s voice and went into puppy mode. “I mean no harm, make it better!” I’ve never read anything about sensory deprivation in canids. I’m just speculating, but I think MeMe’s sense of self was momentarily lost. She probably was very frightened. What happens to dogs who are close to bombs? They would initially lose their hearing. I wonder if they’d act like MeMe. BTW, has MeMe recovered? Or is she still acting different? My dogs have been skunked pretty badly and didn’t react like MeMe did. I wonder if she was already so stressed by the direct hit of the spray, and that set her up for misreading any, even minute, reaction Debbie might have had to the awful odor of fresh skunk as well as the sight of her dog looking so very distressed. I hope that MeMe is feeling better by now. Anyway, we have had very, very good results with using hydrogen peroxide and baking soda mixed with water to remove the skunk odor. It works very well. The recipe is to be found on the web. I would guess it was either what some of the people above have said, that MeMe was disoriented and unsure who her mom was, or, something happened right before the skunk sprayed her. MeMe could have associated whatever happened before (maybe she heard Mom’s voice or something) with the skunk spray and was afraid when her Mom came out…? My guess is MeMe is in the dog equivalent of embarassed. Form the little information you gave, it’s my sense MeMe owns her mom in a good way. She’s the protector, the sentinel, the trusted companion, and the emotional barometer for her mom. By accident. or on purpose (I have a friend who had a black lab hunting dog. Expertly trained and a superior hunter. She often brought back phesants that hadn’t been shot. Sasha (her name) obeyed instantly all calls and hand signals my friend gave her. But Sasha hated skunks. And the only time she refused to obey was when chasing a skunk. She was sprayed many times, sometimes directly in the eyes. But she never stopped chasing skunks. Much to my friend’s chagrin) some dogs, often labs, decide a particular animal is their enemy. Sometimes it’s a skunk, or a opossum, or porcupine. And for whatever reason that animal remains the dog’s enemy for life. I think MeMe got caught between a rock and a hard place. Her enemy, the sknuk was right there, waiting to be chased away. And MeMe’s mom, the person she bonded to and dedicated her life to protecting and nurturing was there too. And MeMe got abmushed and put out of commission by the skunk for awhile. She couldn’t do her job, take care of mom. In fact, Mom had to take care of her. MeMe was not prepared to change roles like that, under such dramatic circumstances. If a dog can feel like it let it’s master down, then that’s what I think MeMe is feeling. I’ve never had a dog skunked, but I’m imagining poor MeMe would have been scared and in pain. Crawled into bed with Deb for comfort and reassurance. Next day at the vet’s, travel and change of venue when her eyes and nose still not recovered from her skunk blast messing up her senses probably made her apprehensive because even the normally familiar, was no longer recognizable to the sense she is most dependant on – smell. ?? With a severe punisher, all behaviors can come to a screeching halt, even the greeting friendly behaviors. Dr. Dan Totora “help this Dog is Driving Me Crazy.” from a gazillion years ago. But then MeMe was ok to jump in bed…perhaps a few hours later, the reward of on the bed was increasing by memory, nighttime with routine. As for the vet …spontaneous recovery???? Time of day or night, sight, smell(ew) topography….even the cheese close to the punishment can be an event marker/cue for another stinky, eye-stinging episode. Ditto at the vet- a normally fun and exciting place must have seemed foreign and scary when she herself felt weak, frightened, and possibly sensory-impaired. From your description, MeMe saw the vet’s as a fun place, not a comforting, calm place. I like roller coasters, but the idea of facing one while down with the flu is horrifying. Maybe MeMe didn’t feel up to that kind of stimulation, or maybe she was simply unsure about what would happen to her there. Even though nothing bad had happened before, she’d never been skunked before- if a helpless looking little critter could do that, who knows what terrors might lurk in previously safe places, waiting to take advantage of her weakened state? Plus, it’s almost certain that MeMe’s humans were acting “weird” toward her. Debby is a SAINT to allow her in bed, but there is no way that a human being can spend time in close proximity to a skunked dog without making faces, turning away, shrinking back, avoiding touch, etc. All of these can definitely send the message that the dog is “wrong”. For a people pleaser, this can be deeply distressing- not being able to do the “right” thing must have been an unpleasantly novel experience for MeMe. Yay for the kittens and Xena, though! So delighted to hear about the taming of Calico and that Xena is sticking around. Here’s wishing the ginger crew loving new homes! Ah! The joys of feral cats. We often do the little-cage-inside-big-dog-crate trick for recovering feral females after spay surgery — and I don’t think I have ever had trouble with it, at least not as you describe. Usually it allows for the cat to hide while also allowing her to have some movement. I wonder if the entire crate was placed in a quiet place and well covered. I am always amazed at how cats go from totally freaking out (doing backflips, spinning, banging faces against the walls of a trap or cage) to totally calm after a cover is placed over a trap or cage. We always, always use trap covers for any feral or semi-feral while trapping and during recovery because they calm the cats so well and usually keep them from hurting themselves. You are one of my favorite animal experts, and I know you were doing the whole trapping under the tutelage of other feral cat folks. But I wanted to mention the trap cover issue in case anyone else was considering trapping. I love that you’re covering this whole saga on your blog by the way! It is downright inspirational for this dog lover who somehow ended up in the world of feral cat TNR. Was this the first time MeMe had been skunked? Our old dog Grace loved nothing more than to hunt the skunks when we took her out at night. We had just moved to a new house with a big yard and barn and always took the dogs out for their last pee of the night. One night, my partner was walking toward the house and looked up and flying right at him in a high arc was a skunk! Grace had silently grabbed the skunk and when it started to spray, she flung it into the air. He didn’t know which way to run or if one could outrun a flying skunk. The skunk landed a few feet away, no one got hurt and so began Grace’s mission to rid our yard of intruding skunks. The reason I asked if this was the first spray for MeMe is the more Grace got skunked, the more she reacted like MeMe. Her first few skunkings she looked proud and pleased to have done battle. Over the years that began to change and the last few times she would come over head hanging, tail tucked, and looking miserable. We never yelled or punished but did give her baths and treatments with enzymes (the peroxide/baking soda really works best). The last few years of her life, if she caught a whiff of a skunk, even far away, she would slink into the house to get away from the temptation of the chase. With Grace, the effects of the skunk’s spray seemed to worsen over time not lessen, not to MeMe’s degree, but enough to override her hunting instincts (at least for skunks). I would say that poor MeMe was hurting and confused. Especially is she’d never been skunked before, she would be confused as to what happened and why. The submissive and appeasement behaviors make sense – she’s hurt and can’t handle anything else at the moment; she’s confused as to why this happened to her, so naturally unsure and afraid, not of Debby herself, just in general. Reduced to total helplessness, she’s relying on those behaviors to ensure her safety and perhaps solicit help. I read the post last night and thought about it briefly. When I read the comments this morning (yea, I cheated, lol! ), I said “aha!” to the comments about MeMe being blind and nose-blind. Absolutely. I’m sure her senses were impaired, perhaps to the point that she didn’t recognize Debby, especially at first. I recently read Inside of a Dog by Alexandra Horowitz, and she talks about dogs not immediatley recognizing their owners if the owners smell is obsured by other odors. (Which resonated with me, because when I first started working at a doggie daycare and came home to my dog, he avoided me and gave me this look. I joked that he thought I was a dog whore. Lol! Maybe he didn’t recognize me at first? Anyway…) So poor MeMe, sprayed in the face by a skunk, would definitely have her senses compromised. She may not have known who MeMe was at first, visually or…from smell, lol (olfactorily? ), and she was hurt and confused, not herself or thinking clearly. And I’m sure she couldn’t smell that cheese! As for the behavior going into the vet’s. Hm. You don’t say how her behavior had been prior to that, if she was back to acting herself or not. I am thinking probably not. I would think she was still a little traumatized from the event, so the travel in the car, going to the vet, etc. was not a pleasant experience, even though normally she likes it. Still not feeling well, senses not back to normal, so she’s anxious in general and hence the behaviors she exhibited. And YAY for all the kittens and for momma cat!! And for you and for the universe answering your needs for Sushi to have the home she needs and for you to still have a cat in your life and your heart. Thank you for sharing this with us! I love reading about the kittens! Cats are so fascinating. Hopefully the kitten will teach mom-cat that people are ok. I think a lot will depend on mom-cats genetics; if she is a genetically shy cat all you can hope for is that she learns to tolerate your presence. If she is genetically bold she may approach you to be handled at some point (though I would probably always use gloves if I needed to try to cage her for vets trips). As for MeMe, as soon as I read it I thought of cats purring. Not the purr of a content cat, but the desperate-for-help purr of a terrified or injured cat. A purr is a sound of comfort, or needing comfort. Dogs don’t purr, of course, but the extreme appeasement may have been “I am totally helpless, blind and unable to smell, so please please don’t do anything to me at all.” A dog, unable to assess anyone’s intent or flee to protect itself (since it suddenly has no idea where it is or where it’s going) might just hope for the best outcome by throwing itself at everyone’s mercy. A different dog might have reacted in the same situation by using threats (growls, hackles, etc) to try to protect its own miserable little corner. Trisha, while you are talking about cats, I’m wondering if you might have some wisdom in a future blog about building frustration tolerance in cats? I know how to help build it in dogs (Corgis are not the most patient breed, and owning them has made me build frustration tolerance into everyday activities out of necessity; I knew nothing about it before but have learned as I go). But in cats, I have no idea. My otherwise sweet and affectionate (and low-energy) two-year-old cat has zero frustration tolerance. If her dinner is late she persistently stalks your feet. If you take her down from a counter or something (no matter how gently) she goes and cracks a random dog in the head (claws in, thankfully). She was once so angry that I took her off the computer desk that she went for my feet. I thwarted her by calmly holding a magazine between my feet and her. She responded by leaping in the air to bite my arm. I know aggression displacement is normal in cats, but I’m hoping to build her tolerance from, er, “zero” to maybe a three? That would make me happy. She is otherwise sweet and loving and gets along with the dogs, and there is zero risk that her behavior would lead to me needing to rehome her unless it unexpectedly escalates at least tenfold. But I would like to build her tolerance in other circumstances. Diverting her to a toy is frequently not possible because the dogs destroy an cat toys that make it into the downstairs. After reading all these good answers, I can’t remember if you said your friend was the only owner of MeMe. Could someone have used a shock collar on MeMe at some point in her life? Or could MeMe not know where this dreadful punishment came from? I agree with the others that MeMe was overwhelmed with stinging eyes that can’t really see and that poor nose burning and not functioning. I wonder if skunked dogs also have some impairment with hearing too. I think if I was skunked in the eyes, I would probably want to sink to the ground until I realized that it wasn’t going to get better. Then I would try to find my way back home. I have also seen similar behaviors in dogs whose handlers used shock collars; pain that seems to come from nowhere & for no reason, & so the dogs offers appeasing behaviors to every one in sight. I’d guess it was a combination of that & sensory impairment. German Shepherd–we had a lovely smootch-fest on Saturday. Sunday when I saw her again I went straight up to her, & she snapped at me. The owner explained that the dog had had an allergy attack Saturday evening, & been given an (unspecified) medication that interfered with her ability to smell, & hence to recognize people she knew. Oscar got skunked this week, so the post is timely. He did not have any in his eyes, thankfully, but at first we were not sure. He ingested at least some. His frantic efforts to rid himself of the smell were dizzying and made us feel helpless. I was not sure if there was a medical emergency for the first several minutes. Although he did not have a severe reaction like MeMe, I could see how he could have (and would) have reacted similarly. As it was, we had to strip all of his bedding and furniture and start cleaning at 2:00 AM, leaving him without a place of his own. It was not a pleasant 24 hours, and I thought the smell would never diminish. Fortunately, time and baking soda help! I hope MeMe is back to 100% soon. I am in agreement with the others that MeMe’s sense of smell and sight had been compromised. I have read that direct sprays to the face can cause temporary blindness and loss of smell. I’m guessing MeMe’s reaction was fear of the unknown- she’s been chemically assulted, lost her sight and smell, and now here comes someone and she can’t make out who it is or what their intentions are. I would be frightened. As for her reaction at the vet’s office, I suspect that MeMe wasn’t feeling like herself. Judging my the redness of her eyes, they were probably still hurting , and still smelling like skunk spray, she was unsure of herself. My dogs seem to react to having their “scent” changed when I give them a bath. While I would describe their reactions as more ornery than anything else, it does seem to cause a predictable unruliness in them for about 5-10 minutes. I would think that the change to MeMe’s scent had to have some effect on how she was behaving. And, yeah for the happy outcome on the kittens and their mama. What was Meme thinking when she was acting submissive after being skunked? My best bet is that she was not wanting to interact with the owner. Despite what the media say, our canine friends don’t always feel like socializing with us. Not to anthropomorphize, but after getting skunked would you feel like socializing? Hmmm…whenever one of my dogs has been skunked, they seem to demonstrate far too much affection towards me – “let me get real close for a cuddle…why are you running away?”… but they’ve never been skunked quite that badly. I’m thinking the interference with the smell and sight senses have something to do with it, MeMe must have been completely bewildered without them. Congratulations on your success with the cats. Great job. My first thought on Meme is-her reactions show how a severe punisher can affect a dog, especially one who has never had anything like that happen. I would think MeMe’s reaction to her owner after being skunked is a direct result of losing her eyesight, sense of smell and outright fear of any contact whatsoever after her attack by the skunk. Her reaction at the Vet was also a fear response from the trauma she had experienced. I hope she is able to forget about this real soon. Lots of good comments here. I agree with those of you who suggested that MeMe was expressing what’s often called “appeasement behavior.” However, I’m not saying necessarily that MeMe was purposefully trying to appease Debby. This is a great example of the problems we can get into when we label a behavior with a presumed function rather than just describing it. Certainly the classic “guilty” look of a dog is often used in contexts in which a dog is attempting to defuse a situation and ‘appease’ another. But it is also the same behavior that you see puppies adopt when they are soliciting care. I suspect that MeMe was terribly in need of help, and was soliciting it from Debby… However, in her extreme pain and fear, she was also acting like people do when they are very badly hurt and all they can say is DON’T TOUCH ME. I don’t know if you’ve ever been hurt like that, but there is a primal kind of protectiveness of your body when you’ve been terribly injured. Any wrong move will send you into worse agony, so your reaction is to keep everyone away. All that adds up to my interpretation of MeMe’s behavior as being ambivalent: Please come help me and Please Please stay away. Make sense? Oh yes you are so right. My dogs give me that look when they have a thorn in their feet! I love your behavior quizzes! I agree with several of the comments about the dog just feeling plainly miserable, having trouble seeing and smelling. That can create a lot of temporary confusion and thus fear in a dog. I’ve seen dog’s body language look like that after getting injured, especially those known for typically being a people pleaser, opposite of the more aloof, independent temperaments. They know that they need help and comfort so they signal that, but at the same time they may be afraid of what that ‘help’ might entail. Especially if they’ve ever been brought to the vet for trauma beforehand. I just read Trisha’s last post, and ofcourse that said it much better than I can! 🙂 Why I love this blog; I always re-examine something and learn something new. Donna, great question. I should have specified that this particular dog crate had been in the barn for almost 10 years, and no doubt smelled pretty much like all the rest of the barn. But great question, thanks for bringing this up. Appreciatively, Trisha-pondering-what-bear-smell-in-closet-would-be-like-but-suspecting-not-good-at-all. My Sophie got skunked about a month ago now. It was just as bad in that it was a full face hit with temporary (thank goodness) blindness and loss of smell. She was just standing there unable to cope and didn’t even react when we scooped her up and ran her to the shower to flush her eyes. Lucking I have the keys to a pet store so I ran and got her skunk remover shampoo which worked immediately and left hardly and residual smell (luckily her thundershirt took most of the body hit). I suspect MeMe was just extremely stressed after having her major senses destroyed and would have reacted negatively to anything at that moment. Sophie is a little girl with extreme anxiety and would usually react aggressively to being scooped up and ran to the shower, but she couldn’t even muster up her usual coping methods to deal with this one. She was totally helpless and unable to cope in any way. This doesn’t have anything at all to do with your post…. I just wanted to tell you how beautiful I think your green bannister with red trim is! Absolutely lovely!